Tonight we enjoyed a night on the town to celebrate my first check from my great new job. What better way to celebrate than to spend some of it? It's been awhile since we had a nice date night aside from our anniversary. Time to enjoy some of the best sushi in the 5 county area at Bluefin. The sushi chefs wear sleek black shirts with a mod fish with the phrase "Got Sushi?" below. I always forget it's BYO and forget to bring my favorite sake. 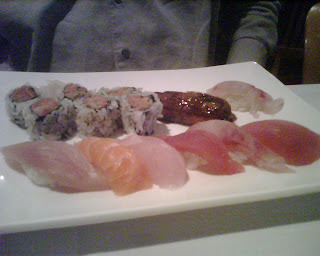 Here's a brief recount of dinner complete with bad pictures from my Blackberry. Wasabi shu mai. Well seasoned pork with wasabi rice dough. The wasabi is almost too much to handle, but these are exciting. 4 to a serving, I remembered the picture when there was one left. Sushi sampler. Note the minimal amount of rice around the spicy tuna roll. The fish is the star and the rice is only a supporting role. 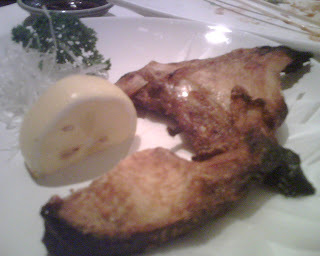 The eel is plump and warm, more akin to a small mackerel than wimpy eel found in other places. I had 3 assorted rolls whose pictures couldn't be saved. Fresh king crab with asparagus and seaweed, and more eel atop spicy hamachi. Hamachi Kame. Yellowfin tuna CHEEKS. These were truly the highlight of the evening. 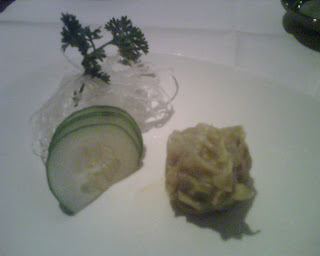 The crisped outside with rich flesh due to the presence of some bone similar in flavor to salmon but more cucumber-y. The skin was flaky and tender. I could have eaten only this and been happy. 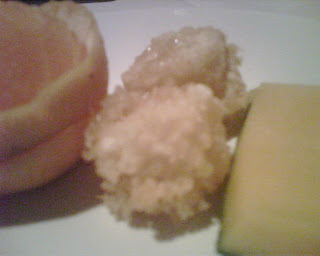 Everyone gets some melon, a piece of tempura banana drizzled with honey, and an orange at the end of the meal. The tempura banana is divine. Why do Asian restaurants have the sweetest, juiciest oranges? 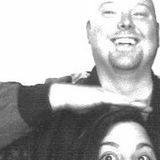 With the return of DINK status I hope to dine out more often and report back here. Do not miss Bluefin. Make a reservation or wait a long time for a table! 1017 Germantown Pike -Plymouth Meeting, PA 19462 Phone: (610) 277-3917.